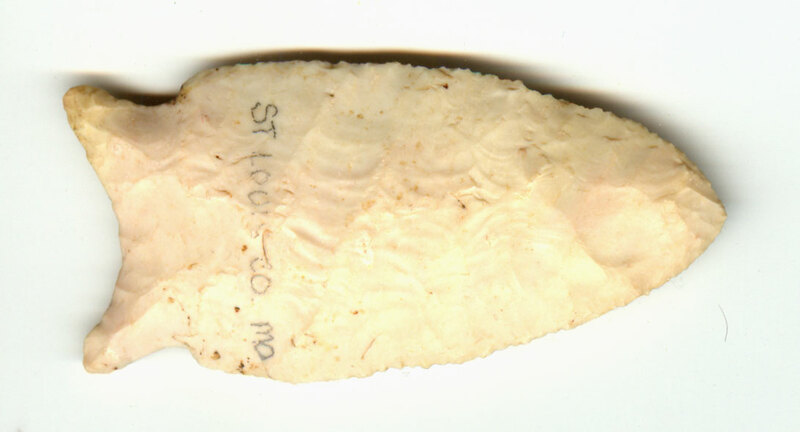 A Medium To Large Size, Visibly Aged And Anciently Use Sharpened, Finely Serrated, Well Made Hemphill Style Dalton Point That Exhibits Stone Aging Coloration And Overall Surface Patination, Correct Rolled Basal Stem Edge Hafting Dulling, Evident One Side Aged Extended Ground/Element Difference, Aged Surface Deposits, Correct Early Style Blade Flaking, Correct Material And Manufacture For The Area Found. The Short Basal Stem And Expanded Auricles And Finely Serrated Blade Edges Determine The Point Type. This Is A Highly Collectible Artifact, Displaying Excellent Workmanship! Includes Dwain Rogers And Ken Partain Certificates Of Authenticity.